Big (2012) is a popular Hong Sisters' romantic comedy Korean drama with wistful fantasy elements. The reason to watch this spry and oddball Korean drama is for the enchanting performance of its lovely leading lady, Lee Min Jung, who is probably best remembered by K-drama fans for playing "Monkey" in Boys Over Flowers, even though she has quite an admirable body of work in other television dramas and films in her own right, including Fates and Furies, Midas and Cunning Single Lady. Her character in this show is absolutely the nicest, warmest, and sweetest role I've seen her play yet. All her other characters she's played have an edge about them, but here in Big she is the epitome of sincerity, kindness, even wisdom. If I were a man I would want to marry her myself! (But I guess Byung Hun Lee was the one who lucked out). This is my top favorite performance of hers; it's often in comedy that an actress really proves her mettle, though most people assume a melodramatic role is bigger evidence of acting brilliance than a comedy. I completely disagree with that: any actress can put on a sad face and make you tear up, but making an audience laugh is the far more difficult task. That takes real acting skill! With a switch ... literally! Gong Yoo plays the lead male role and does a good job here, but his character is far more over-the-top than his most memorable role in Coffee Prince: the reason being that for most of the drama he is playing an 18-19 year old trapped inside the body of a man in his 30's! Sometimes that can grow tiresome, you want to tell his character to "Grow up, already!" However he got the mannerisms down pat of a typical teenager, not easy to do for episode after episode and make it believable. In addition he had to show the lad growing up and maturing and falling in love with sincerity and at a reasonable pace, and that's not easy to achieve either. Suzy (Dream High) plays second female lead who is in love with the real 18 year old young man, even though her feelings have never been reciprocated. Her character is appropriately annoying, an immature teenager, often with a big bow in her hair like she's playing an 8 year old Shirley Temple, and she goes around groining the guys with her leg when she's petulantly ticked off about something. I found her character to be the most difficult to relate to and to tolerate, since she seems to always do anything she wants and to get away with it all, including lying, physical violence, trying to steal another woman's guy, and kidnapping a patient out of a hospital! I didn't find any of her machinations funny and every time she entered a scene I cringed, wondering what childishness she would come up with next. I had enjoyed the actress in Dream High and Gu Family Book, but in many ways this character did nothing for her career. She was much better in the film Architecture 101, which came out the same year as Big. Sometimes when an actress is transitioning from teenage to adult roles she'll hit some bumps along the way. Second male lead role is played by young actor Shin Won Ho, who has the most thankless task of playing an accident victim in a coma through 95% of the drama! He only has speaking lines in the first and last episodes. Most of the time he's asleep in a hospital bed! I felt so sorry for this gypped actor, but on the other hand how cool is it to make tens of thousands of dollars per episode and be required do nothing but lay down on a bed and have your eyes closed. LOL.Can I find a job like that, to be paid to SLEEP? The Story: After a while being unemployed, Daran Gil (Lee Min Jung) is hired as a permanent substitute and homeroom teacher at a public high school, where she quickly comes in contact with a new handsome young male student from America named Kang Kyung Joon (Shin Won Ho) who seems quite taken with her, especially when she intercedes for him when he comes face to face with school bullies who try to punch him out, including her own younger brother Choong Shik (Baek Sung Hyun from Stairway To Heaven and White Christmas). It's pretty obvious right from the beginning that both teacher and student are attracted to one another, although Daran doesn't acknowledge it at all and determinedly treats him kindly just like any other student and Kyung Joon tries to keep his distance and settle for staring at her from afar. Through a set of comical coincidences at the beginning of the story, Daran had become engaged to a doctor named Seo Yoon Jae (Gong Yoo) but he never seems to have time for his fiance, which causes her some distress. It gets to the point where Daran tells him over the phone that she is tired of his excuses for rarely spending time with her, especially in preparation for their wedding, and that she demands he tell her if he's even truly in love with her at all. He finally says he will talk to her in person, that he has something very important to tell her, he jumps in his car and races to get to her, while at the same time the student Kyung Joon is riding his motor bike coming from the opposite direction. There is an accident and both men are thrown over a cliff while riding their vehicles and they plunge into water below. In the water Yoon Jae saves himself first and then reaches out his hand to the drowning Kyung Joon, saving his life. However, in the water, as one man grabs the other's hand, a miracle occurs: their souls are switched. At first, in the hospital, it seems that Yoon Jae the doctor has died and his body is transferred to a hospital morgue, while the young Kyung Joon appears to be in a coma, hooked up to machines in the ICU. However in a creepy moment "Yoon Jae" wakes up in the morgue very much alive, but it's really Kyung Joon inside his body who wakes up. The real Yoon Jae remains in a coma, trapped inside the body of that 18 year old kid. For the majority of the drama Kyung Joon has to adjust to living the life of a 30 year old doctor; he manages to claim at work that he needs extensive time off in order to recover from his horrific accident, but the clock is ticking -- just how long can he keep up this pretense? The truth is revealed to Daran and she has her own coping to do, grieving for her fiance in a coma in a kid's body, and with this 18 year old kid in Yoon Jae's very handsome mature body, whom she is due to marry in just a few weeks. Daran continues to wonder what exactly Yoon Jae was racing to tell her before the accident and then she finds out he was having a secret relationship the whole time with a female doctor at work, Se Young Lee (Jang Hee Jin from Que Sera, Sera and The Village: Achiara's Secret). She is numb with shock and grief and who is there to confide in but the only person who would really understand, Kyung Joon, trapped in her fiance's body! The attraction that had begun at a bus stop outside the school grounds begins to grow in earnest between two people with adult bodies and a similar sense of humor and joy in life. Lots of endearing humorous and tender scenes between them make for an interesting romantic story. However, if the men's souls are ever switched back, what will happen to all their lives? What if Yoon Jae wakes up and tells Daran he loves her after all? What would happen to the real Kyung Joon? 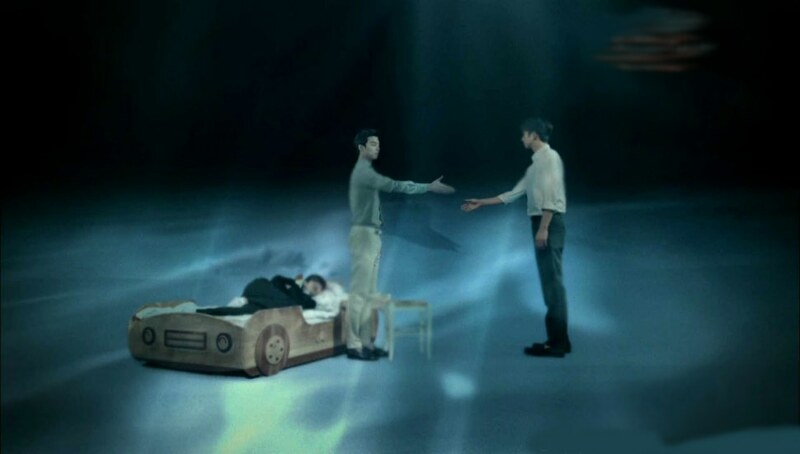 There are some highly charged family secrets to be revealed in this drama, about the births of both man and boy. There are some haunting, bittersweet moments including unhappy separations due to misguided efforts to protect the other loved one from harm and distress. Kim Min Jung and Gong Yoo have very nice chemistry together, it's sensual at times but never sexual, so this is a show the whole family can watch and enjoy together -- nothing objectionable is in it. There is a twist ending that will surprise many -- some people claim they don't like the ending, but I had no objections to it because it was overall a happy one -- except for one objection -- they don't give that young actor playing Kyung Joon, Shin Won Ho, his full due for sleeping through the majority of the drama! The writers and producer should have been a bit more brave in how they approached the last shots in the drama, showing Shin Won Ho under the umbrella instead of Gong Yoo. In only one year he would not have aged to look like Gong Yoo. Maybe ten years, but hardly one. Plus they should have dyed Shin Won Ho's hair a dark color for the role instead of light, to account for the age transition at the end much better.